This is one of those types of pens that holds your interest the first time you see it. The main element is the visually appealing wood main body and the reliable Signo gel ink. While the Uni-ball Woodnote catches your attention, it falls flat in comfort, function and price compared to the other options in the Uni-ball brand. Anyone that uses regular wood pencils will feel right at home when using the Uni-ball Woodnote. It has almost the same type of texture but more of a smoother feel than a regular pencil. Most of the body is made up of recycled cedar wood except for both end pieces and the cap, which are made up of plastic. This is a small pen without the cap posted measuring about 4.5 inches long. 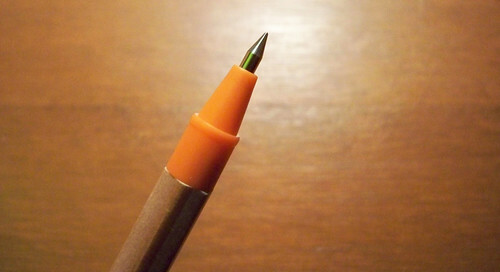 The bulk of the pen is taken up by the plastic cap. I'm rather torn here because I really wanted to like this pen but there are several issues that make it irritating to use. The wood body has a quality feel to it but it's also too smooth and slick. It's hard for me to find an ideal comfortable grip especially since my thumb and index finger rest right between the wood and plastic. I wished the wood texture came completely up the whole barrel right before it tapers into the pen point. Right now my fingers rest right on the part line between the materials which doesn't feel comfortable at all. The writing quality is less than ideal which is rather surprising considering there is a Signo gel ink refill inside. Maybe it's just this particular orange refill that came with the pen but it feels difficult to write with. 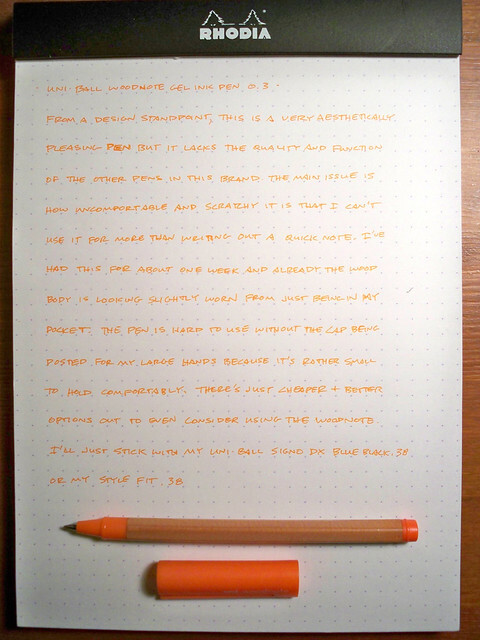 I decided to switch out one of my blue black refills in my Uni-ball Style Fit for the orange refill in the Woodnote. There was a slight improvement using the blue black refill in the Woodnote as well as the orange in the Style Fit but even so, the Style Fit just felt better to write with. Writing with the Woodnote on copy paper tended to drag across more slowly then smoother paper. It also felt rather scratchy against the paper which made it feel like more effort was required to write with. This really isn't the ideal pen to use for carrying in your pocket due to it's durability issues with the wood body. The wood frame seems to easily be nicked especially if you have any keys or other items in your pocket. The other problem I had revolved around the overly flexible and flimsy clip. The clip is so flexible that I worry how effective it would be using it to attach anything to. The quality of the clip reminds me of the cheap Bic pen cap clips that will take a new shape if you happen to bend it. I also have a problem with how the cap rotates when posted on the end. The cap is definitely secure but it feels like your going to lose it when you rotate it. Maybe I'm just used to caps that stay firmly on place to really adjust to this pen. The Woodnote just doesn’t cut it for me due to its scratchy writing quality and uncomfortable recycled wood body. This seems like more of a novelty pen to me rather than something practical that I can use everyday. Take away the wood and you would have just a standard pen that wouldn’t be good enough to put in my regular rotation. At nearly 5 dollars on JetPens, this is a more expensive option considering their are cheaper and better options in the Uni-ball family. The Uni-ball Style Fit with the exact refill is not even half the price and feels better to use than the Woodnote. Posted on December 7, 2011 by Brad Dowdy and filed under Pen Reviews, Uni-Ball, Woodnote.